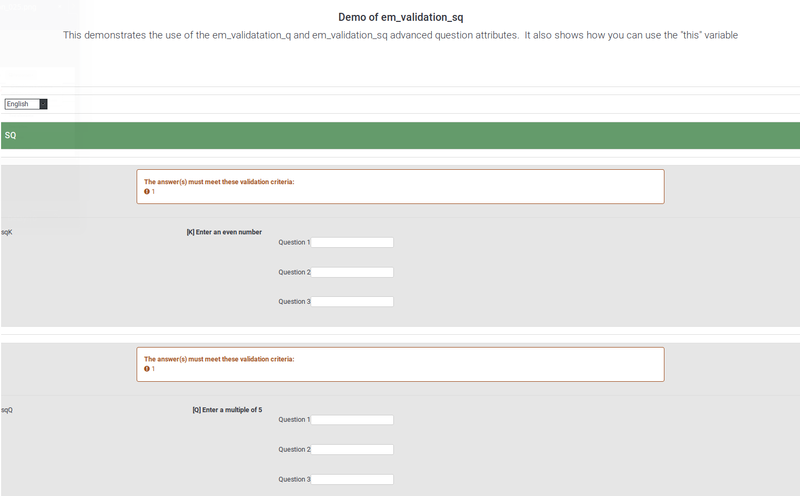 To open access the data entry panel, access one of the survey-related settings, select the Responses menu entry and click on the Data entry screen button. This function is not intended to be available to your participants. When LimeSurvey was first developed, it was intended as a data entry system for paper-based surveys. The Data Entry screen is intended to be used when entering returned surveys on a mass basis. Later it has been designed to allow for keyboard based entry (using tabs, space bar, arrow keys, number pad, and keystrokes). Keyboard shortcuts that can be used while adding your data into the response table: tabulator key (move to the next question) and shift key + tabulator key (move to the previous question). If the "Finalize response submission" checkbox is not checked, then the answer will be considered as "not completely filled out", no submission date will be added to the record, and the token will remain available to the participant. Start language - displayed only if additional languages are used. To continue filling out the survey, the respondent has to click on the link from the email. When asked for credentials, the name and password from the email have to be used. This page was last edited on 16 January 2019, at 12:50.